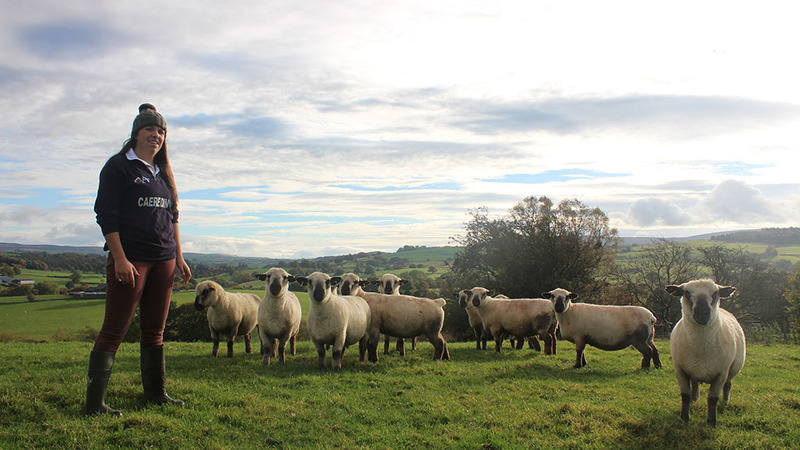 Beca Glyn, 23, graduated from Aberystwyth University in (BSC) agriculture and business and now works on the 140-hectare (350-acre) National Trust family beef and sheep farm in Snowdonia National Park, at Dylasau Uchaf, Padog, Betws y Coed. Winter: With the nights drawing in it is time to bring the cattle in over winter. On the sheep side it was an early start to the mountain to gather the flock from Cynefin, which is the sheep exclusive part of the open mountain. With rams due to be turned out to the ewes in the next few weeks, it has been a busy week – I body condition scored all ewes and rams, sorting them into different groups, preparing and making all the health checks necessary ready for tupping. At last the ewes and ewe lambs are ready to go to tack over winter. Over in the cattle shed early one morning we had new arrivals of twin calves. At the end of the week I have been putting my university experiences into action by helping to prepare an application form for a sustainable production grant – hopefully it will be successful. Social: It was our Young Farmers Club county Eisteddfod last Saturday and most evenings in the past two weeks I have been in the local Ysbyty Ifan hall rehearsing short drama – of course my part was a farmhouse wife. Brexit: Because I am so passionate about farming I hope the financial aspect of agriculture will sustain a viable future for me. But I am concerned about the seismic change which has happened with Brexit. In my mind it is vital to keep family farms alive because of the valuable contributions they make to animal welfare, landscape management and culture; especially the Welsh language in Wales. One of my biggest challenges will be – given historically we exported 30 per cent of Welsh lambs to Europe – to have a trade deal with EU post-Brexit and a market for our produce. Another challenge is global warming. I am adamant the agricultural industry is not the problem but it has the answer to the problem. We must focus on opportunities which exist and build on them. I think we should always focus on a cup half full rather than a cup half empty. Future: My plan for the future is to run the family farm and stay in my area. To be able to do this I may have to think about diversification, depending on what the future holds for the agriculture industry. I am determined to live in Cwm Eidda where our culture and language are an important aspect of life.